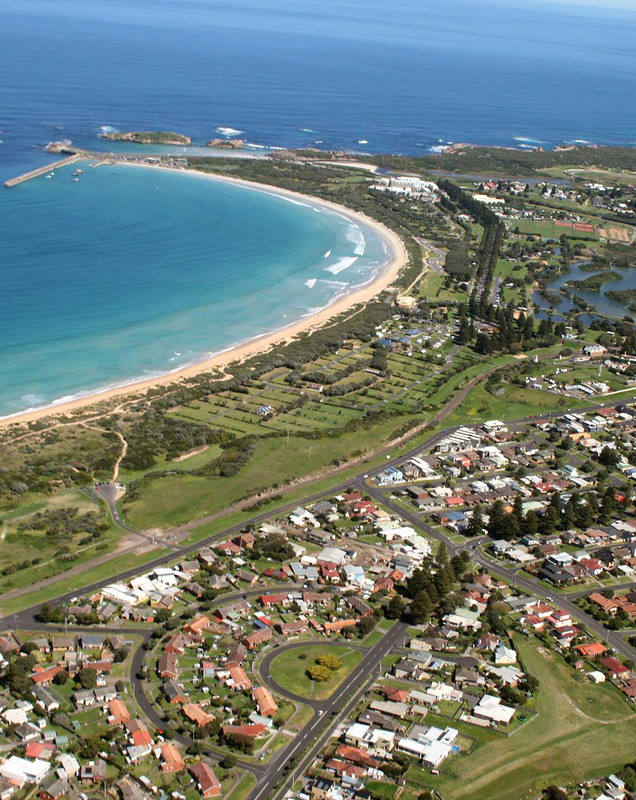 Warrnambool is a popular tourist destination, with about 715,000 visitors each year. It is also a comprehensive regional service centre. The mainstay of the economy is agriculture and its support industry (particularly dairy farming and associated milk processing). Other major industries and services include retail, education, health, meat processing, clothing manufacture and construction. As well as the spectacular views from the Great Ocean Road, there are several beaches nearby, some of which are used for surfing. In the winter months, Southern Right whales are regularly seen in the waters near the city at the Logan's Beach Nursery. The Warrnambool Botanic Gardens feature wide curving paths, rare trees, a lily pond with ducks, a fernery, a band rotunda and was designed by notable landscape architect, William Guilfoyle. The Lady Bay Lighthouse complex is on the Victorian heritage register due to its significance as an example of early colonial development. There has been a flagstaff on top of Flagstaff Hill since 1848, and the current lighthouses were moved to the site in 1878. They still operate as navigation aids for the channel into Warrnambool harbour. Flagstaff Hill Maritime Village is built around the original lighthouses and now operates as a heritage attraction and museum for the Great Ocean Road. Flagstaff Hill houses an extensive collection of shipwreck and maritime trade artefacts in both a museum and village setting. It has also been awarded Winner of at least 3 Victorian Tourism Awards - Tourist Attraction. The post office and lighthouse date back to the early days of settlement. Eleven suburbs surround the CBD of Warrnambool: North, South, East and West Warrnambool, Brierly, Sherwood Park, Merrivale, Dennington, Woodford, Bushfield and Allansford, though only the four latter are recognised as localities of the city. There are several bars and hotels in the city including The Flying Horse Bar and Brewery, the Seanchai, Warrnambool Hotel, The Whaler's Inn, The Royal, The Western, The Caledonian, Mac's, Rafferty's Tavern, The Gallery, The Loft, The Victoria, The Fishbowl and just out of town The Junction Hotel. The Warrnambool foreshore is a popular swimming area, and is adjacent to the Lake Pertobe parklands. A number of caravan parks are also located in the area. Warrnambool is situated on the Princes Highway between Port Fairy to the west and Terang to the east as well as at the south-western terminus of the Hopkins Highway. The Great Ocean Road terminates 13 km east of Warrnambool, near Allansford. Rail and bus services also operate to Melbourne and Geelong. V/Line passenger train services call at Warrnambool's two stations, Warrnambool in the city and Sherwood Park in the city's outer east, seven days a week. A daily container freight service is being run by Pacific National for local container handler Westvic. Local buses under the Transit South West brand cover Warrnambool's city and suburbs and extend to the nearby towns of Port Fairy and Koroit. V/Line coaches connect Warrnambool with Portland, Mount Gambier, Ballarat and Hamilton. Warrnambool is home to the Grand Annual Sprintcar Classic, a race which attracts Australian and international drivers on the Australia Day long weekend. The city is also the finishing point of the Melbourne to Warrnambool Classic cycle race. It is the longest one-day bicycle endurance race in the world, held every October since 1895 to be the world’s second oldest bike race. Warrnambool has a horse racing club, the Warrnambool Racing Club, which schedules around twenty race meetings a year including the Warrnambool Cup and Grand Annual Steeple three-day meeting in the first week of May.The Woodford Racing Club also holds one meeting at Warrnambool racecourse. The Grand Annual steeplechase has 33 more jumps than any other horse race and is one of the longest steeplechases in the world. The Warrnambool Greyhound Racing Club also holds regular meetings. The Wunta festival held in Warrnambool every February is one of south-west Victoria's major community festivals. It incorporates a wide range of entertainment for all ages. The Flagstaff Hill Maritime Museum is in Warrnambool and is built on Flagstaff Hill that also holds the original lighthouses and Warrnambool Garrison. Its most prized item in its collection is the Minton peacock salvaged from the Loch Ard. Flagstaff Hill has been awarded the winner of at least 3 Victorian Tourism Awards - Tourist Attraction. Sport is highly popular in Warrnambool which has a competitive local football league and is the origin of many high profile AFL players. The city has three Australian Rules football teams playing in the Hampden Football League (North Warrnambool, South Warrnambool and Warrnambool). Golfers play on the Warrnambool Golf Club course on Younger Street.